Today I’m giving you all my tips for how to freeze, thaw and transport your cakes. As many of you already know by now, baking and decorating a cake takes time! It’s not a process that should be rushed. It’s why I like to spread out my baking and decorating over the course of a day or two. Actually, with my crazy schedule, I’ve even been known to bake an entire cake a week before an event – decorated and all! So don’t let the fear of time prevent you from making a delicious tasting and beautiful looking cake. In today’s post, I’ll tell you how to freeze, thaw and transport your cakes. Just last week I visited my friends at Fox 13 The Place to share my tips for freezing, thawing and transporting your cakes. If you’re a visual learner like me, you can check out my segments by clicking the link below. Everything I cover on the show is also outlined below. You can bake your cake layers up to a month in advance. After the cake layers are completely cooled, wrap each individual cake layer with 2 layers of plastic wrap, followed by tin foil. If the cake can fit, you can also place each cake layer in it’s own zip lock bag. If you only need to store your cake layers for a few days, still wrap each cake layer in plastic wrap two times, but you can skip the foil and zip lock bag. Before using your cake layers, remove the layers from the freezer about an hour or two before you plan to decorate. You don’t want the layers to be completely frozen, but having them chilled will make stacking and decorating much easier. You can also freeze completely finished cakes. After you decorate your cake, put it in the freezer for a couple hours to set the buttercream. When the buttercream is set, wrap the entire cake with plastic wrap a couple times, followed by tin foil if the cake needs to be stored for more than a few days. The night before you plan to serve the cake, transfer the cake from the freezer to the refrigerator to start thawing. Keep the plastic wrap on. (Moving the cake right from the freezer to room temperature will cause some condensation and you’ll get water drops on your cake. If you’re using fondant, this will create water droplets between the buttercream and fondant and you’ll start to get bubbles in your fondant). About 4 to 5 hours before serving the cake, transfer the cake from the refrigerator to the counter. 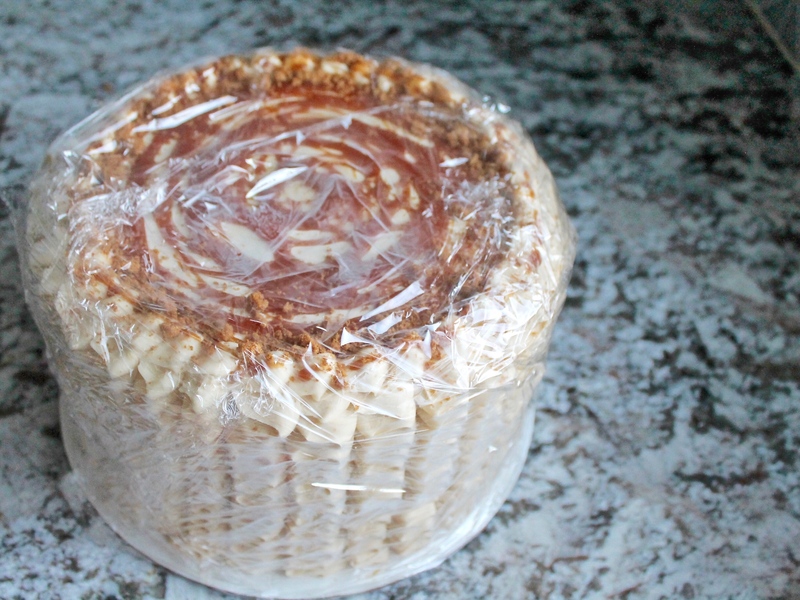 Remove the plastic wrap and put the cake in an airtight container or box to retain freshness. First, before you even start decorating your cake, you’ll want to tape two cake boards together for your base. The first cake board should be the same size as the cake layers. Place that cake board on top of a cake board that is one size bigger. Having this larger cake board under your cake will allow you to move it in and out of the freezer during decorating without damaging the frosting. You’ll also use this larger cake board to help secure the cake in a cake box for transporting. Second, make sure your cake is chilled when you’re ready to transport. I usually keep my cake in the refrigerator before until it’s time to deliver. When it’s time to travel with your cake, place the cake in a cake box. I like the two piece Wilton cake boxes (see link below). Depending on the size of the box and the size of your larger cake board, you may be able to slide the cake into the box and see that the larger board fits nice and snug inside. If the cake board is smaller than the box, make sure to tape the sides of the cake board to the bottom of the box. For more of my cake tutorials, check out my TUTORIAL PAGE or visit my YOUTUBE PAGE. I usually skip the plastic wrap all together, put my cake in the box and put that in a clean non scent garbage bag and Close it up with a knot in the access (the handles) store in the freezer for however long you need and then put it in the fridge 24 hours to thaw! Works perfect and then you don’t have the hastle of all the foil and plastic wrap! My mom used to do her wedding cakes this way so that’s where I got the tip! Love this tip, Hannah! Thank you! Questions: Do you just use double sided tape to fasten the smaller and larger cake boards together? Also, would you mind sharing the details as to why shouldn’t you decorate a frozen cake? I use rolled up masking tape to hold the two boards together. As for frosting, you don’t want to decorate with completely frozen cake layers because the cake layers will harden your frosting, making it hard to spread. I like to keep my cakes chilled but not entirely frozen so they’re easy to handle but won’t change the consistency of the frosting. Take them out of the freezer about an hour before you stack and decorate. Thanks so much! I’ve been trying to find info about how long to freeze cakes before decorating/serving for a while now! Have you noticed a problem with water color decoration “bleeding” while defrosting? I want to try water color decoration but afraid the colors will start bleeding when going from freezer to fridge to room temp. Thank you so much!! Yeah, the watercolor can be tricky on buttercream. I like the edible art cake paints. Those do the best job at holding their place, vs. food gel thinned with extract or alcohol. I think the colors should be ok from the freezer to the fridge, but you might find the colors will bleed when it gets to room temp. I’d recommend keeping it in the fridge and serving it chilled. Could I skip the plastic wrap and tinfoil and put the decorated cake in a freezer safe sealed cake carrier? Would the cake still tast fresh and yummy if I skip those steps? Yes, if it’s airtight, you should be good to go! Hi Courtney! You’ve inspired me to start baking 🙂 I’m wondering if you level your cakes before you freeze them or if you level them once they are thawed. Thanks!! I level them after they’ve completely cooled and before I freeze them. I just wanted to say how awesome this website is! I’m only 18 and I am building up a cake business and I have learned so much from these tips you give! Learning how to properly freeze, thaw, and deliver a cake has been HUGE for me from reading this because now I don’t have to feel so rushed to get cakes done. Thank you! I’m so happy to hear I’ve been able to help! Good luck with your business! How long can you keep finished cakes in the freezer before they aren’t good anymore? If you cover it, you can keep it in there for about two weeks. Even when I take my layers out of the freezer an hour/two before, I still seem to get bubbles in my buttercream when it comes to room temperature. I don’t have a freezer that will fit a finished cake. I usually crumb coat, refrigerate to set, finish icing and then keep it refrigerated until time to transport it. It’s after that, when it’s finished and coming to room temp that I get some bubbles. How can I fix it?? So, when our frosting bubbles after it’s been frozen and defrosted, it’s actually likely that the cake layers had some condensation on them before you even began frosting. It was because of all your awesome tutorials that I made 22 cakes for my daughters wedding!!! Baked, frosted, decorated, froze, and thawed! I didn’t have to transport any cakes farther than the barn luckily:). It was an amazing night! Next to the bride, the cakes almost stole the show:). Thanks for every detailed instruction!!! OMG! 22 cakes! Wow!!! That’s amazing. Way to go! I’m so happy to hear that everything worked out so well! This has helped me so much, I have two cakes I need to make 2 cake for the month of October one a birthday cake and another a wedding cake for my best friend and I can’t deliver the birthday cake on on the day of the birthday party because I will be out of town. Finding this article has helped me figure out my time schedule on when I need to do things for both cakes, and instructions to give to my friend on how to thaw it out in time for her daughter’s birthday party. and help me figure out how to do all of the above for the wedding cake I was soo stressing over on how to transport it with out it getting ruined. Hi Courtney! I love your content and was so happy to see this post! I am making a cake for a coworker but I will be on vacation the day it’s needed. So we decided I’d give it to her a few days in advance for her to put it in the freezer. Since the cake will be in a box, do you think wrapping just the box in Saran Wrap and foil would be enough? Or do you recommend I still wrap the cake itself before putting it into the box? I would greatly appreciate your feedback and thank you so much! Hello! Thank you for all of your amazing content! I am actually preparing a cake for a coworker but will be on vacation during the actual event and will have to give it to her a few days in advance. Since I will need to give the cake to her in a cake box anyways, do you think if I wrap the box well with plastic wrap & saran wrap that would suffice? Or do you recommend I still wrap the cake up as well as the box? Since she’s not too familiar with freezing cakes, I hope to make it easy for her and also make sure the cake comes out alright without me there! Thank you for everything you do! Yes, I think keeping it in the box with the seran wrap around it will work well. Thank you for sharing these tips with all of us! I have a wedding 2 hours away, but am going up the day before (have a full refrigerator in a suite hotel room). 6in, 10in (for tiered cake), three sheet cakes. Do you think if I have everything frosted and frozen and put in cooler with dry ice it will stay frozen (enough) until I can get it to the hotel room freezer/refrigerator? Do you have a better suggestion? Thanks! Yes that will work great.